Stuart Mack is an internationally award-winning trumpet player, composer, and educator based in New York City. Since moving to NYC in 2016, Mack has received a Masters degree from Manhattan School of Music and has done tours across the world. Most recently, Mack has been on the road with the David Liebman Big Band as well as Anat Cohen’s Tentet. 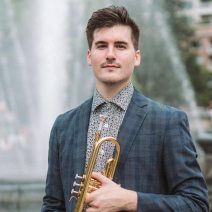 Having played music for over fifteen years, Mack has received high honors, including being a featured soloist with singer Josh Groban on the Texas leg of his “Stages” tour, winning first place in the 2015 International Trumpet Guild Jazz competition, placing 2nd in the 2014 National Trumpet Competition (Jazz Division), being a finalist for the 2013 Carmine Caruso International Jazz Trumpet Competition, being selected to compete in the 2015 Keep An Eye International Jazz Award in Amsterdam, NE, and being recognized as a 2014 Yamaha Young Performing Artist. As well, Mack has acted as the guest artist for the 2016 Bryce Luty Jazz Festival (Hutchinson, KS) and Illinois Valley Central Community College Jazz Band (Olgsbey, IL). After graduating from Washington Community High School, Mack received a scholarship to attend the University of North Texas’s world renowned jazz program. While there, Mack played in the six-time grammy-nominated One O’Clock Lab Band for two years. Through the One O’Clock, Mack was able to travel to and headline events such as the Next Generation Jazz Festival (Monterey, California), the 2014 Jazz Education Network Conference (Dallas, Texas), as well as the Frank Sinatra Celebrity Invitational Golf Tournament (Palm Springs, California). Mack can be heard as a member and a featured soloist on Lab 2013 and Lab 2014. Having played professionally for the past twelve years, Mack has built up playing experience with various groups throughout the New York City area and elsewhere throughout the United States. During the summer of 2012, Mack was the only freshman selected across the country to play in the Disney All-American College band. There, he was able to work with the great jazz educator Ron McCurdy as well as some of the best college musicians in the country. Beyond maintaining a busy performing schedule, Mack is making a name as a teacher. Mack has run masterclasses and clinics at universities and high schools across the country and currently runs his own private studio. Mack teaches live lessons to students in the NYC area and Skype lessons to students across the world.